Indeed, it is probably just a case of a broken clock being correct twice a day and in fact the government is telling the truth. They are dutifully protecting public health by taking action to find the source of the disease and close the parks. As the Asahi Shimbun reported, “[h]ealth ministry officials on Sept. 1 confirmed 19 new cases of dengue fever, bringing the total to 22 in a country that had not seen domestic infections of the disease for about 70 years” (1). I was disappointed because I often spend a few days of free time in late summer to enjoy some of Tokyo’s parks – rare glimpses of greenery in a sea of asphalt and concrete – but this year at least two major parks are now closed due to the dengue fever scare. Dengue fever is a very painful and potentially lethal disease. While speculation about controversial topics in the SNS sphere should be taken with a large grain of salt, there is a theory that the government has used the dengue scare to shut down Yoyogi Park in order to block what was supposed to be a “huge” September 27, anti-nuclear protest. Before you laugh and shout “conspiracy theory” (although you might be right in this case) read on. Given that practically everything many Western (including Japan) governments say these days are lies, dutifully parroted by the Media, it does make one wonder. Just because you’re paranoid doesn’t mean they’re not out to get you. Here’s the story according to Japanese SNSers familiar with nature topics: Apparently dengue fever does occasionally occur domestically in Japan in the summers, but it is hushed up and not covered by the media (sound familiar?). While there are regularly many cases of imported dengue into Japan, this is supposedly the first year they have occurred domestically in many years, according to authorities. But this year is Japan Prime Minister Shinzo “I Love Nukes & Military Spending” Abe’s big push to restart the country’s idling and costly nuclear reactors. The timing is interesting. Not only did Abe recently appoint a pro-nuclear woman to his cabinet (to soft peddle the cute and cuddly image of nuclear power) but it was recently announced that the first nuclear restart has been approved in Kagoshima prefecture in the far south of the country (2). This is despite the fact that “more than 60 percent of local governments that host or surround a nuclear power plant are cautious about restarting idled reactors even if they meet new safety guidelines” (3). According to the dengue conspiracy theory, this year the government manipulated the data to make it look like the dengue cases were specifically emanating from the park. There is also a theory that the fevers are caused by the spraying of chemicals and pesticides in the area, that mimic the symptoms of dengue. The motive: Where a huge anti-nuclear demonstration was to occur on Sept. 27, in order to combat the push for reactor restarts– now the park has been CLOSED! The canceled anti-nuke event will muzzle the opposition and pave the way for nuclear restarts. In the summer of 2012, tens of thousands, upwards of 100,000 demonstrators or more, gathered in just that park, Yoyogi Park, in order to protest the government’s nuclear policy (4). Considering the anti-constitutional and dictatorial leanings of the Abe administration, it is not a ridiculous hypothesis to consider that The-Powers-That-Be took advantage of the dengue scare to manipulate data for furthering administration goals. Of course the lapdog media is always on hand to play its role in furthering such myths, as happened in the grand daddy conspiracy of all time, the 911 “terror attacks” (5). Incredibly, the man who wrote his college thesis about the creation and maintenance of state myths is also the one man who was in charge of the 911 investigative committee (6; 7). That’s what we simple folks call putting the fox in charge of the henhouse. The nuclear restarts are a big mistake in a country that is built on a plate of jiggling tofu, not to mention surrounded by a host of potentially vomitous volatile volcanoes (VVV). Japan’s scientists originally opposed introducing nuclear power because they thought it was not only impractical but dangerous, and they were right. Today, Japan could easily transition to solar and wind power and implement a multi-year plan to offset its reliance on nuclear power and fossil fuels (8; 9; 10). But the lack of political will, in part squelched by the inability of the opposition to build any momentum, allows the nuclear juggernaut to plunder onward. with less than 10 percent of that amount, could be the prime cause in killing the ocean this time (11)? Is it possible that a combination of factors including Fukushima has brought the ocean to its breaking point? I suggest viewing this chart and analysis by my Auzzie mate, Christina MacPherson (12). The chart shows the relative contamination from manmade sources of radiation versus natural ones, and Fukushima rates very low on the scale. If we accept that Fukushima released equivalent the amount of radiation as Chernobyl, that is still ten times less than from above-ground atomic bomb tests. “THE NUCLEAR CONTRIBUTION to the Anthropocene Epoch has already been great – with the landscape scarring effect of thousands of atmospheric and underground atomic bomb tests. Radioactive pollution – from atomic bomb making, and testing, and from several parts of the nuclear power chain has affected soil, groundwater and air. The chart might seem deceptive because the amount of manmade radiation is indeed small compared to that which occurs naturally, but some researchers believe that living organisms have adapted to naturally occurring radiation throughout evolution, whereas artificial radioisotopes have different effects on organisms. “Uranium found in nature is present in the food and water chain, is soluble, consists of about 2 millionths of a gram of daily intake. Since it is widespread throughout many organ systems and is then eliminated through bodily processes, no cluster of cells receives a concentrated dose of radiation. Therefore, [author Paul] Zimmerman notes that uranium from nature ‘presents an infinitely small hazard to the health of the organism as a whole’ ”(13). A “basic point of understanding blurred in the public mind by the nuclear establishment is gauging the effect that natural uranium has on the human body versus uranium that has been concentrated for nuclear technology. The nuclear establishment claims that the effects of eating a banana which may be relatively high in uranium content, is equivalent to an insoluble microparticle of uranium which may become lodged in the lung after a depleted uranium (DU) munition explodes on the battlefield, or when a nuclear accident such as Fukushima releases large amounts of hot particles into the air where they can be swept by the wind and then inhaled” into a human lung (Ibid). “The solubility/insolubility of particles released by nuclear weapons or radiation accidents would depend on the chemistry of the nuclides involved. There is not a blanket answer for all radionuclides and whatever other atoms they might be bound to. Hot particles are particles composed of hundreds/thousands/millions of molecules which contain some quantity of radioactive atoms. How that particle behaves in the human body has a lot to do with how easily is dissolves in body fluid. Both soluble and insoluble particles of uranium, plutonium, radium, and the other alpha emitters release alpha particles into surrounding tissue. The significance of INSOLUBLE particles is that they can have a much longer residency inside the body, perhaps a person’s entire life. This gives them increased opportunity to successfully target biologically significant macromolecules such as DNA in their vicinity” (Ibid). Fukushima may be one of the nails in the Pacific Ocean coffin but it is not the only one. Many speculate that the Pacific Ocean is dying or that Fukushima is even “an extinction level event.” It may be true the Earth is reaching its breaking point and decades of over-fishing and pollution have profoundly damaged the world’s oceans, but the cause is not only from Fukushima. How do you attribute marine die-offs occurring around the world when not enough of Fukushima’s radiation has reached that far, and there are many other sources of pollutants in those regions? One mistake the alternative media analysts are making is that they are confusing the huge amount of radiation presently on site at Fukushima versus the amount that was released from the accident and has since leaked out. “The total spent reactor fuel inventory at the Fukushima-Daichi site contains nearly half of the total amount of Cs-137 estimated by the NCRP to have been released by all atmospheric nuclear weapons testing, Chernobyl, and world-wide reprocessing plants” (14). But that material has not yet dispersed, therefore the ocean die-offs now cannot be blamed on harm that could potentially occur in the future. Since the time of the accident there was much concern about the Unit 4 fuel pool because of the enormous number of highly radioactive fuel rods stored on the 4th floor of the building. If another big quake hit they could come tumbling down and release a pyroclastic blast of radiation. However, according to Tokyo Electric Power Company (Tepco), most of the fuel rods have been safely removed and the completion is expected within the year. The next problem is where to place the dry cask storage units. In addition, it is currently impossible to get at the fuel stored at the other reactors because of the extremely high radiation, let alone gather up the melted corium. The alternative media is right to sound the alarm bells loud and clear, but they must also remain focused on the truth (since the mainstream media and governmental and science institutions largely fail us in this matter). The marine biologists that should be researching these urgent questions are funded by the Global Elite. I wonder if that big meeting of scientists we heard about concerning Pacific Ocean contamination will come to anything or naught? Richard Wilcox is a Tokyo-based teacher and writer who holds a Ph.D. in environmental studies and is a regular contributor to the world’s leading website exposing the Fukushima nuclear disaster, Rense.com. He is also a contributor to Activist Post. He is a contributing editor and writer to the book: Fukushima: Dispossession or Denuclearization? (2014). His radio interviews and articles are archived at http://wilcoxrb99.wordpress.com and he can be reached by email for radio or internet podcast interviews to discuss the Fukushima crisis at wilcoxrb2013@gmail.com. 11. 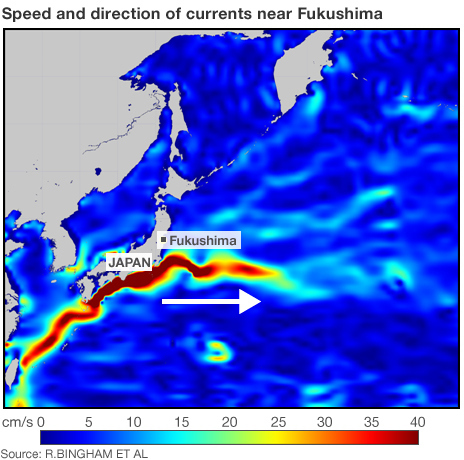 How Badly Is Fukushima Radiation Damaging The Pacific Ocean?